Untouchable directors Olivier Nakache and Eric Toledano have a lot to smile about. Their little French film about an aristocrat quadriplegic (Francois Cluzet) and his caretaker from the projects (Omar Sy) has had international success at countless awards ceremonies and film festivals and blown all box office expectations out of the water. Nominated for nine Cesar awards (the French Oscars) but winning only won for Best Actor (the irresistible Omar Sy), the directors came to London ahead of the UK release of the film in 2012. The Weinstein Company are distributing Untouchable and after such incredible success across the globe, Nakache and Toledano are hoping the film will be as warmly embraced in the UK as it was in the rest of the world. Read on to find out what the pair had to say about tackling a comedy drama dealing with the thorny issues of race and disability, how they feel about a US remake of the film that has brought them such huge international success and why they say the UK is a big influence on their style of comedy. Untouchable is based on a true story but how does the film differ from real life? ET: Yes we are in fiction, so we decided to write that and to find how to express our style and our sense of comedy. The main situations are true. For example the opening scene with the cops is totally true… In France we have two or three arrests already, problems with the guys who did the same fake thing with the police as we saw in the movie and so they go to jail. And for example the fact that Driss connects Philippe to the woman is true because he… organised the wedding of Philippe. It was not in France, it was in Morocco. The place changes but the idea is the same. Now when you do a comedy you are looking for the same and you try to find new situations to express the kind of relationship so that’s why we chose for example to invent totally the opera with the tree in German. We invent the quiz with the classical music and the dance and everything. All this is our interpretation of the relationship but what is true is that it was really politically incorrect, the relationship. There were no limits in jokes, no limit in everything and this is the main idea. In the true story Philippe’s friend is an Arab and in this film he’s from Senegal originally so what informed that decision? Why did you decide to change that? ET: We did not decide to change. We wrote the script for Omar because it’s a long collaboration between Omar and us. It’s our third movie with him. We made a short movie with him and we knew that one day we would take him for a main character and when we discovered this story, it had Abdel, you’re totally right he’s not black but we knew that it’s a part for Omar. Out of this, we have to make something clear because in each country it’s hard to understand our culture of people. In France you have Paris and you have the suburb, you call it the project here and in the United States… and in this kind of project you have many immigrants and this is a social group and most of them are black and Arabs. This is the main population that we have… and Omar is representing as equal the group. So no one in France told us, ‘hey it was an Arab’. Because they speak in the same language… they dress in the same style so the idea of the movie was, how can we imagine the meeting between an aristocrat and a guy from the suburb, a guy from the project. And Omar is the best one to do that. In France, because everyone knows him, his personality, his character, everything on TV, everyone knows that he had a handle on this, he knows how to do that. So that’s why we switch very easy and even we didn’t wonder ourselves is it a problem? But I have to say now after 50 countries that in the United States it was a problem. You can’t choose a black like this. If you choose a black you have an idea so I have to explain each time that in France after 90 million admissions, one French in three, no one asked but I understand the question. ON: And when Abdel discovered the movie, he said ‘oh great I discovered that I am black… I never realised’. 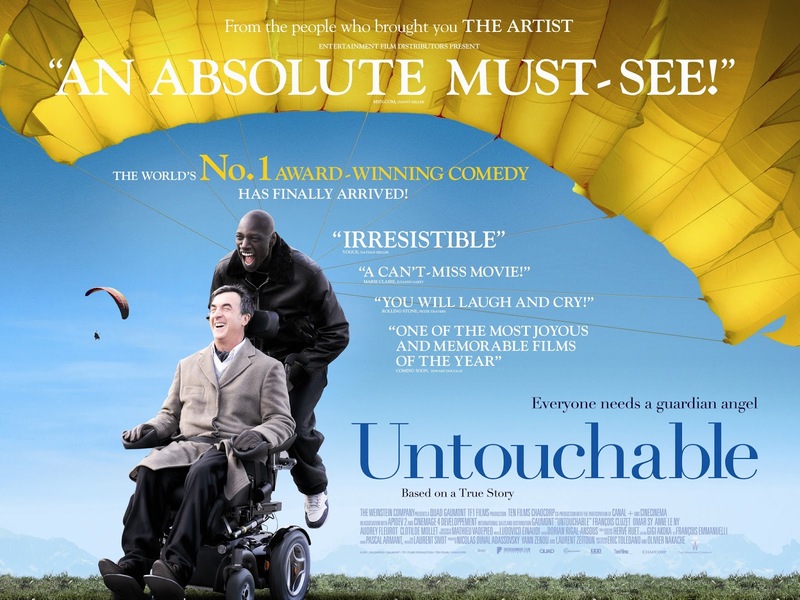 As a viewer you can take many meanings from the title, Untouchable. Does that term apply to Driss as in no one else came close to how he can make Philippe feel? ET: There were many reasons and it was like a sign for us because we were looking for a title and we had a marketing problem, a very simple marketing problem. If you do a drama, you choose very easily a title. And you make audiences understand they going to see a drama. If you choose a comedy, you choose a title of comedy and everyone knows that. If you have something like our movie which is really a mix between a drama comedy or comedy drama or whatever you have to choose something very between. Untouchable means many things. First of all, when we told the story of this movie, everyone said don’t touch this story. And it’s true. Don’t touch because we don’t touch comedy and disability, comedy and projects, comedy and immigration. This is taboo. This is a big taboo in society. Disability… you can’t laugh at that. You cannot make jokes with that. Immigration… wow this is taboo! Religion, Muslims, Black, Arab, don’t touch so it was like a challenge to say Untouchables… we can touch. And also we have the Indian caste that we call the Untouchables. This is the last, the fifth class in the Indian society and they live outside the town. They are not allowed to live with the others and we have a similarity with the guys of the suburb, of the project because it’s a kind of separation, segregation. We have the rich whites who live in the town and in Paris… and the poor have to go outside of Paris and… you can find like a metaphor of Untouchables. And we decided that, it’s hard to touch someone who doesn’t feel. Nothing. And you have to change him like a baby, you have to take care of him, you have to give him some food and there is something disgusting, you don’t want to touch so he is untouchable. They are untouchables and we shot a special sequence of paragliding and they are on the mountain and they are out of the world. And really on the real sense of the shooting, they are above everything and we felt when we shot that, that they were untouchable and unreachable; protected from society and from conventions. When you are an aristocrat, you don’t go with a black from the suburb. This is a convention. But they are crossing the line of the convention and that makes them totally untouchable for us. You said that there were no limits between the real Philippe and Abdel about what they could say to each other. When you took the script to Philippe, was there anything that he thought went too far? ON: … If the brain works, everything works but we know that sometimes when we wrote the script, we say oh maybe we’ve gone too far but if it’s funny for us, it’s funny so we have our own limits. We don’t want to be mean or you know we have our own limits about the humour. But… this story interests us because of this because we can put a lot of comedy and Omar is a secret weapon for comedy. Everything is ok with him. The relationship between Philippe and Driss is very close and it’s a really good dynamic. How did you get that from Francois and Omar? ON: Every person who meets Omar fell immediately in love with him. It’s very easy. ET: It’s a chemical problem with Omar. ON: He’s a good man. He’s a good father. ET: He’s very humble. He knows how to respect everyone so it’s hard to not be with Omar in a perfect relationship. So as with the others, Francois felt in love with him… Because he [Omar] is not an actor and because he didn’t go to the dramatic art course and he didn’t learn the work of acting, he is very spontaneous and natural and he’s not really playing. And when really Francois felt that, he was really excited. He said ‘wow I’m playing with this guy and it’s going to be enormous because he’s not playing, he’s just living the situation. You explain to him the situation, you say ‘you have to do that’ and he’s just living the situation. You say dance, he dances. You say play, he plays but just realise that this guy has ten brothers and sisters. He grew up in the project far from Paris and he has no idea about all of this. His father was a labourer. His mother was a cleaner of offices in Paris at night. No money so he’s coming from the base. One of the most memorable scenes in the film is Philippe’s party when they are playing different sorts of music. They play the Vivaldi and the ‘Boogie Wonderland’. Which one do you guys prefer? ET: We don’t know why but he’s never coming to Paris. But we discover the classical music with Philippe because when he explained to us that we were looking for a common language between the two guys and music was very good because you can speak about music and you can understand who is who and with the classical we felt something special. There is something very beautiful in the classical [music]. And that’s why we decided to put the classical music in when he [Driss] comes back to the suburb to help his brother with the problems. Vivaldi was a real discovery. The scene where Driss is shaving Philippe and he says ‘one cut and this could all be over’ is very dark but it quickly turns light again. ET: This is directly a metaphor of this movie. They are very close to… something very dark. They are close to the dark because one is really suffering of a physical problem, even if he’s rich, you can’t avoid being in suffering. As rich as you are, you cannot avoid that. And the other one has no future because when you grew up in this kind of neighbourhood, you have no future. It’s very predictable… We were thinking about emotion, dark and joy. And the joy can be very close to that [the dark]. Have you never seen that sometime you are in a cemetery and you have a need to joke or to say something very horrible but just to say, this isn’t theatre or the circus? Everything is nothing. And this is for us, the function of humour, to take a dramatisation and to have a step back on the situation. And I think when he says, ‘one [cut] and it would be better for me’, he’s really thinking about that because he has a beard and he was depressed at this moment. But the relationship is wonderful because he [Driss] can take him and get it out of him and how? He makes him laugh. Hitler and Freddie Mercury [Driss shave his beard to make Philippe look like these figures] and everyone is laughing and after, he is in a good mind, he can take him back to the life with a girl. Because love is the only solution. I remember that in the movie of My Left Foot of Jim Sheridan, about the painter, at the end, the only solution was to come back to love with the nurse and it’s always the same situation. As Olivier said when you have the brain, you can do everything, you are normal. It’s just the physical body problem. How was the first screening for Philippe and Abdel? ON: …with his new wife and with people from his family so maybe it was a little bit touchy you know with massage. But at the end we saw tears in his eyes and cheeks and he said ‘I stand up and I clap with my hands’. So we were very happy and he supports the movie. That was the most important thing. ET: Our most important thing was he was supporting the movie, he was there on the official night… He was very involved. We now know there will be a US remake. What are your thoughts on that? ET: For us, we were happy, because we thought that it was a good idea and now we made one year of touring the world, we saw that it’s possible to reach the audience with this movie. So we understand that it’s only for one market, for the United States. Not really for the others. Because in the United States, we know that it’s impossible to reach people with subtitles. But if I was the director of this movie, it will be a big challenge because we did a good job... But we are in a very good relationship with The Weinstein Company. They help us to have this huge success in the world so we have to respect the fact that if it seems like a good idea… that’s good for us and for them and we won’t be really involved. We’ll just have a look on this. The movie that we love, we did. Some directors (George Sluizer and Michael Haneke) have remade their own films for American audiences. ET: It’s bizarre… I think in the life of a director, you could perhaps have ten or fifteen movies if you’re very brilliant… [unless you are] Woody Allen or two or three exceptions, you can do many, many good movies so I think there is no justification to do twice the same movie. For us it’s nonsense. Do you have a favourite part of the film or a part that you’re really excited for audiences to see? ON: For me, I like the scene when… Omar shaves Francois because for us, it’s exactly what we want to create in the movie. It is deep scenes with you know a core moment, a moving moment and love. This balance, this mix is difficult to try and it’s like a rollercoaster of emotions and we like this because love is emotion and crying is emotion and we like to… surprise the audience, like he said ‘just a cut and everything it’s over’ and after we want to take the audience and make [them] laugh. It’s really good timing for this film here with the Paralympics and the recent London riots. Disability and disenfranchised youth are very topical now. It will be interesting to see how the UK reacts to this film. ET: In general we are very curious about the audience reaction here for many reasons. One about the Paralympics, I entirely agree with you. The second one is because, we did a bit of travel but we now have the choice to come or not to come in the country…. It’s really true that we have big respect for the English culture. Why? Because on the music, on the cinema, we feel very near and you know… we like and are total fans of Ricky Gervais and Extras for example. Because in a certain way this is how to cross the line in a different way… he cross the line about races, there is in Extras some things [that are] awful, how can you say that? About race, about blacks, about Jews, about everything but they cross the line and we like this kind of humour. We like also… the social comedy of England. ET: But we don’t remember the name of the movie which takes place in a funeral home. We have the guy who dies and all the time we have the guy who died here. It’s English and a very big success. ON: Yes! Death at a Funeral! ET: The line is crossed many times. ET:… so we have really respect for the culture in England. So we wanted to come and we are very curious about the reaction. We were curious about the reaction in America. Even if we had many problems… We were curious about Japan, we are going to look at the audience like this [mimes a telescope]. Laugh or not laugh.